Better known as episodes 27-30, the Wolf's Rain OVAs are like the natural four last episodes of the series. If you've read my review of the 26 episodes of the anime, I had a few gripes. Combined with the OVA, on the other hand? Intense, emotional, and gripping, the OVAs are the climax of Wolf's Rain. This is where Nobumoto really shined... a good shounen series, but with a seinen-class masterpiece of an ending. The story is given proper closure and the action is at its flashiest, but the characters are beyond what I can describe. It brings them alive and pulls you in, and I found myself near tears for people I hadn't even cared about before. Make sure you set aside time to really watch this. Prior to watching this, I thought Wolf's Rain was overhyped. That notion has now disappeared. This OVA honestly doesn't feel like an true OVA. There really is no difference to the animation or sound, and doesn't add much to the show besides more problems for the characters. The soundtrack is the same soundtrack they used in the show and there is no new characters introduced. Just another sub-plot that is cleverly told in a way that doesn't make it seem out of place. In order to "finish" the series in just four more episodes, the pace is fast and to the point. The constant attention to detail and new developments is enough to make people watch. Granted, this ending is better than what people got with episode 26, but it is still open-ended makes you feel that they didn't accomplish much. It gives the sense that Wolf's Rain is a never-ending series, though this is implied. Anyway, if you love Wolf's Rain, you'll most likely love this OVA as well. There really is nothing to bad here unless you really hate endings that are not as solid as a concrete wall. I almost gave this a 9 overall, my reason, it seems rather open-ended during these last 4 episodes of Wolf's Rain, but I realize, that was definitely the goal of the producer, Bones, now, I have watched all the way through another of Bones' series, Space Dandy, and the ending of that was also very open-ended, not that these two anime are anything alike, i just thought I would mention it. At first it bugged me, but now that I think about it, I actually really like the ending, This was an exciting, emotional, and unique ending. It was just as outstanding as the first 26 episodes, great action, awesome adventure, everything about it was amazing, it seems rather unique compared to what I have seen, but in a good way (the whole series in general) at first it seemed about the same as a lot of other anime I have watched, but it grew into something different these last 4 episodes, actually is when it changed so much for me, it almost seemed unreal, it grew rather intense, and made me feel how the characters felt, it was awesome, so it will easily make it into my top ten, I can't actually put an official rank on it, but it's up there. Very recommended for those who love emotional series, along with adventure, sadness, action, and maybe even a little bit of comedy put in there, (just a touch), this goes for these 4 episodes, and the first 26, so watch it if you fall in these categories, It's well worth it. 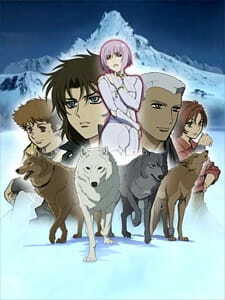 This is a sequal to the series: Wolf's Rain. So this picks up after the end of that one. In a nutshell, usually people would refer to Wolf's Rain OVA with an &quot;Eww, that totally killed the series.&quot; If that's all you've been hearing, then you should perhaps give it a chance. It isn't totally evil and bad. The story itself was a little dull, and the ending... That was a bit obvious after a little bit. The Entire story isn't very sound, or very continuous. The Art, it was decent. With a bunch of blood splattering everywhere... It was decent. The colors were well done, and the landscape was nice too. It doesn't get a nine because, the battle scenes were a bit more head one warrior type instead of Ninja back stab and jump away. There wasn't too much action, expecially when it wanted to get things done. I felt they kind of rushed things. The sound. It was good. Not perfect. I didn't get a rush because of the sound. But the music did give to the entire storyline and add effect to it. Characters. Perhaps one of the better qualities of this anime, and this ending OVA of the series. Character begins to show, and each one takes a different spin on life. There was much character building, and character creation, without all the flashbacks. I did enjoy it. Perhaps more than the series. It did touch my heart and I was tearing at the end of it. Overall an 8. It had characteristics of a good OVA section. It showed some of them, but the ending was the worst bit.